Avant de bazarder le patrimoine religieux! Discussions around the knowledge and alienation of religious objects, with Joanne Chagnon, Edith Prégent, Denis Robitaille, Vincent Giguère, Jean-François Royal, Sébastien Daviau and Pascale Bergeron. Note: Participants who would prefer to send us their payment by mail should write their check on behalf of the Quebec Religious Heritage Council and send it with the registration form before October 27, 2018, to 100 Sherbrooke Street East, Suite 3300, Montreal, Quebec H2X 1C3. This form can be completed on the screen. To do this, be sure to open it with Acrobat Reader. Destination Saint Camille, the MRC of Bellechasse, La Contrée en montagnes dans Bellechasse, Territoires innovants en économie sociale et solidaire, the Béati foundation, Samir Admo, town planner, and the Quebec Religious Heritage Council of Quebec join in the holding of an activity intended for the promoters of projects of reinvestment or transformation of churches. This event took place on April 12, 2018 at the La Durantaye Multifunctional Center, La Durantaye. 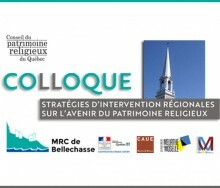 The MRC de Bellechasse and the Quebec Religious Heritage Council are dedicated to engaging cultural professionals, elected officials and the general public in a symposium on regional intervention strategies for religious heritage, which is part of a cooperation with France. The conference aims to address local ownership and consultation tools that promote territorial development. Several speakers will share their experiences, including the Mayor of Baie-Saint-Paul, Marie-Julie Asselin Cultural Development Officers, the MRC de d'Autray and Éliane Trottier, the Portneuf MRC, and Muriel Manciaux, vice- President of the Mad and Moselle Community of Communes, in Lorraine. Does A Church Can Become A Library of The 21st Century? This symposium was held May 4, 2012 in Montreal. 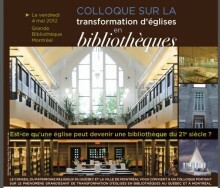 In Quebec, a dozen church library projects have emerged or are emerging in both urban and rural settings, demonstrating how it can be opportunities to reuse churches abandoned the practice of worship. The reuse of these buildings libraries particularly acute issue of the use of a founding heritage as much as the design of libraries of tomorrow. The conference aims to take stock of the experiences, but also on the converging trends that show tie-downs between built heritage in search of uses and libraries in search of new spaces. This conference aims to provide new insights into the strengths and challenges of a church library transformation through the fresh perspective of library, architecture and heritage. 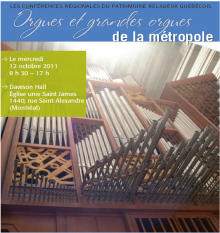 This regional conference was held on 12 October 2011 at the St. James United Church in Montreal. stakeholders to reflect and discuss their personal experiences in the protection and enhancement of these majestic instruments. During the day, participants will be invited to explore and identify various possible avenues to find viable solutions to ensure the sustainability of this important heritage and develop or democratize the knowledge related to it. In the morning will be presented several lectures on various aspects of life of the organ in the metropolis, and the afternoon will be reserved for two site visits. This regional conference took place on 13 May 2011 in Carleton-sur-Mer. 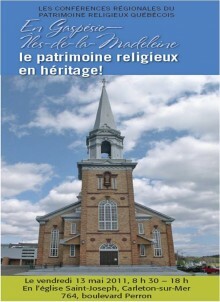 Under the theme "In Gaspésie-Îles-de-la-Madeleine: the religious heritage ! " this regional conference invites various stakeholders in the Gaspésie-Îles-de-la-Madeleine exchange on possible avenues for conservation and development of their religious heritage. Are therefore invited all organizations, managers, administrators, professionals and all those arrested by the search for practical and sustainable solutions to meet the needs of the people and respecting the specificities of the rural world. In the morning will be presented several lectures to stimulate discussion at workshops planned for the afternoon. The day will end with a plenary session. This regional conference took place on 22 October 2010 at l'Avenir. 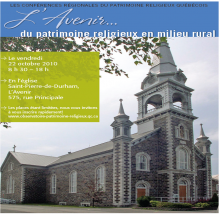 Under the theme "The Future of... rural religious heritage", the first regional conference invites various stakeholders Centre-du-Québec and Estrie exchange on possible avenues for conservation and development of their religious heritage. Are therefore invited all organizations, managers, administrators, professionals and all those arrested by finding practical and sustainable solutions that meet the needs of the population and respecting the specificities of the rural world. This conference took place from October 7 to 11, 2009 in Quebec City and Montreal. 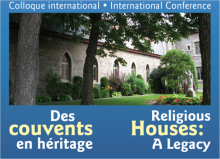 This international conference aims to identify and analyze innovative heritage solutions for the future of the monasteries, abbeys and, more generally, convents in Quebec, Canada and in the West. This will be the case, for the comparison of cases and putting them into theoretical perspective, historical or geographical, contribute to the future of these architectural complexes, urban and landscape. So we aim to examine specific ways of implementing the proposals being considered in Quebec and to share these experiences in order to contribute more broadly to the resolution of the issues raised and explored on the western scene. To do this, the conference aims to bring together American and European researchers and professionals and decision makers who have distinguished themselves in the examination or the implementation of innovative, or which, due to reflection historical and epistemological problems of secularization, reassignment or governance of former houses, are able to feed the debate on the financial implications, legal, urban planning or memorial of the change of use of the convents and their development. This conference was held on 23 and 24 November 2006 in Montreal. This conference will reflect on the possible multiple issues of transfer of assets to future generations and populations recently settled in Quebec. Reflections of eminent experts, discussions with you and examples of dynamic initiatives inspire our three day process. Contributions will be interdisciplinary, from fields as diverse as museology, history, theology, religious studies and architecture and attempt, in turn, identify practical solutions to the development of knowledge and ways of implementation thereof. Pursuing this goal, we want to address, through seven key themes, one or other of the following questions, according to a disciplinary perspective and specific expertise in transmission difficulties (abandonment, indifference, mediation), the multicultural dimensions (ethno-religious tensions, discrimination, cooperation challenges), setting value and ownership, the meaning of the religious heritage of Quebec in contemporary culture (transcendence, stories, history and memory, values, etc.) and finally, education (at school level, public education, distribution, etc.) . The symposium will be followed by the publication of his actions in the fall of 2007, which, while being expanded, raise awareness, we hope, the greatest number. What Future For Which Churches? 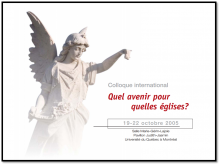 This event was held from 19 to 22 October 2005 at the University of Quebec in Montreal. Throughout the West, many churches of all religious traditions are closing for lack of worshipers and worship leaders. These high places of our cities, our villages and our memories are in danger of disappearing more or less imminent. Forty North American and European specialists analyze vucues experiences and formulate proposals for the future and ownership of these buildings Nobres, their vocation and their use. He also assess the challenges of urban planning and management of such buildings in the city, redefining their community vocation and their status within the community. 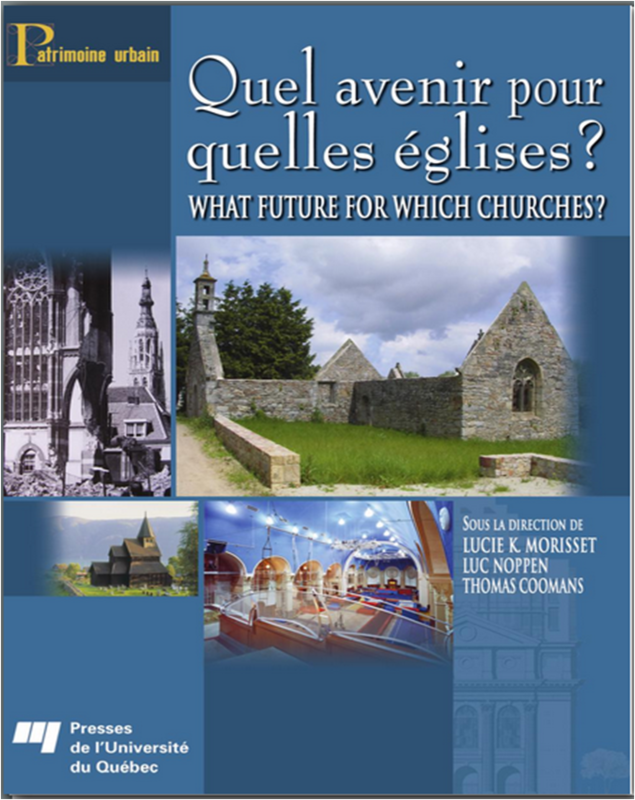 Proceedings of the symposium - What Future for which churches?